There are so many skills that I want our daughters to learn. From cooking meals to sewing on a button or doing laundry, these middle-school years are full of opportunities to teach them things that will be important for them to know in the future. Most valuable, however, are the spiritual foundations I can lay in these years. As they begin making the transition from being a girl to a young woman, I want to make sure they’re prepared for the changes that will take place. I think that the age at which you discuss these issues with your daughter varies somewhat according to their interest, maturity, friends, school situation, etc. However, I do think it’s important to time it so that they are learning about these things from you first rather than from their friends. How I wish I had all the answers for the challenges that arise during these years! Yet I’m seeing that my frustrations and inadequacies drive me to God to ask for His wisdom – which is where I need to begin. As I’m introducing my girls to the beauty of womanhood, here are a few resources that I’ve found helpful thus far. 1. 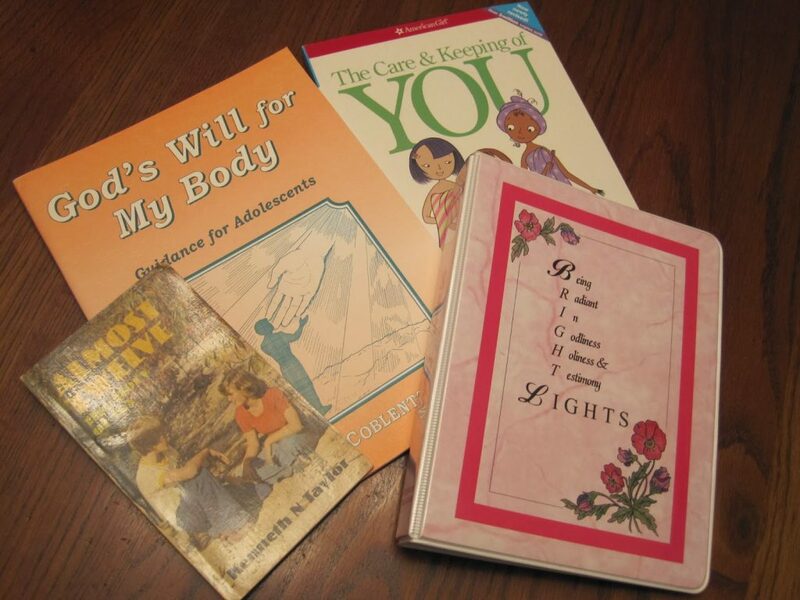 The Care and Keeping of You: The Body Book for Younger Girls by Valorie Schaeffer. I am not a fan of every American Girl product, but I did find this book to be a practical help in talking to my daughters about the changes that would be taking place in their bodies as they mature. Since it’s not taught from a spiritual viewpoint, it’s important to include discussion about the amazing way that God made their bodies and how we are to be good stewards of His temple. 2. God’s Will for My Body by John Coblentz. My mom actually bought this workbook for us, and I used it with my older daughter to introduce the concept of intimacy in marriage. It has Bible passages to read and questions to answer. Each day I had her do a section by herself, then we would sit down and discuss it together. We did skip one brief part that included an overview of practices I didn’t think she needed to know about at this point, but I really appreciated the Biblical way in which the subject matter was presented. I’ll be ordering another copy to use with my younger daughter. 4. Bright Lights Curriculum. We used this for our Bible lessons during our first year of homeschooling. I saved the set so that we can go through them again. These appear to have changed a bit since I ordered them, but we used Set 1 and Set 2. The topics cover the spiritual and practical side of becoming a young lady – attitudes, testimony, purity, honoring parents, etc.. I may not agree 100% with everything taught here, but I thought that the lessons were very helpful for my girls. We’ve only just begun this journey, and I am always on the lookout for other resources, so please leave me a comment if you have other suggestions. Ooh! I'm not ready to even think about these things yet! But I appreciate your listing these resources, and I'm going to bookmark this post for when I do need it in the future. Yes, you've still got awhile 😉 As you know, though, it does come faster than you think!